Percussion Ensemble is designed to meet the needs of the percussion major, music education major, or non-major. The group performs one concert each quarter (fall, winter, spring). During Spring quarter, the ensemble will attend and/or perform at the Northwest Percussion Festival. Percussion technique and performance practices/styles are taught in a group ensemble setting. Both music majors and non-majors may join, however players are admitted to the ensemble by audition and at the discretion of the director. 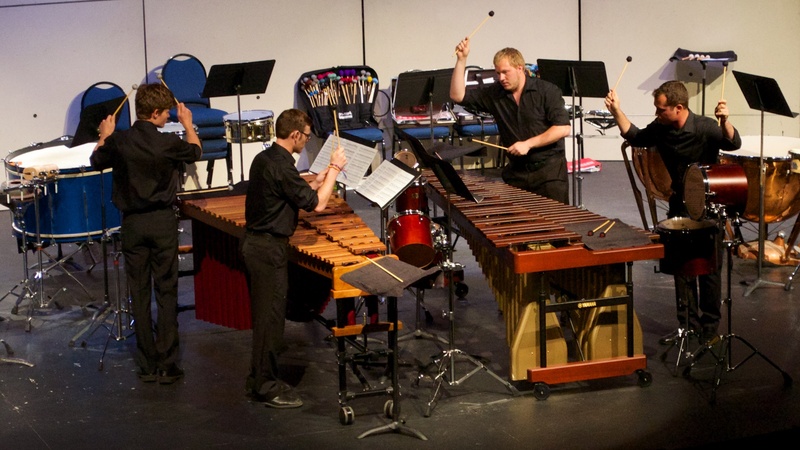 The WOU Percussion Ensemble aims to challenge students in a multitude of percussive styles in the pursuit of the advanced study and performance of the percussion ensemble repertoire. The ensemble regularly features upper-division undergraduate and graduate students as soloists or featured performers. Open to all percussion students at WOU, and to others by consent of the Director.